The House today passed a $328 billion spending bill that funds 11 government departments through next September, but it appeared doubtful that the Senate would take up the legislation before Congress reconvenes next year. The huge measure, which lumps seven annual spending bills into one, passed by a vote of 242 to 176. Known as an "omnibus" spending bill, it provides funds for non-military activities of the government, including education, health, veterans programs, foreign aid and the space program. The bill also includes $492 billion in spending that is required by law. The legislation bears the strong imprint of the White House, which pressured House and Senate Republicans in final negotiations to insert language that waters down Federal Communications Commission rules on media ownership. Negotiators also overrode a provision, approved earlier by both the House and Senate, that prevents the Labor Department from amending mandatory overtime rules affecting eight million workers. The final spending bill frees the Labor Department to go ahead with rules that redefine eligibility for overtime pay, now typically time and a half for 40 hours of work in one week. The bill now goes to the Senate, where Sen. Bill Frist (R-Tenn.), the majority leader, is not inclined to bring members back to take up the proposed legislation before Christmas, sources close to Frist said. That means the bill probably would not go to the Senate floor until late January. Rep. Tom DeLay (R-Texas), the House majority leader, hailed passage of the bill and said Congress had made difficult and important choices that "reaffirmed our commitment to fiscal discipline." He noted that the bill contains money for a "school choice initiative" in Washington, D.C., that he said would allow 1,700 low-income children to attend schools that their parents choose. Democrats and some fiscal conservatives charged that the bill had been loaded up with an unprecedented number of projects for states and congressional districts, including funds for local art museums, universities and even a "first tee" program that teaches young people the game of golf. DeLay defended the projects, saying lawmakers were better positioned than "bureaucrats" to decide if a project in a district was needed. Citing funds channeled to a hospital in Houston, which lies partly within his district, DeLay said, "I'm not ashamed of the fact there are earmarks in this bill." Rep. David R. Obey (D-Wis.) responded that DeLay "should get the Pulitzer Prize for fiction" for saying the bill showed fiscal restraint. In debate before the bill was passed, Obey blasted the package as being too heavily larded with pork-barrel projects, also known as "earmarks," while falling short in vital areas such as education. The bill "shortchanges some of the most basic obligations of government, yet finds room for over 7,000 individual member pieces of pork," costing taxpayers more than $7.5 billion, Obey said. He charged that the legislative process had evolved in such as way that "congressional pork, rather than substance," has now become the "total dominant consideration" in major spending bills. Obey was particularly critical of a House-Senate conference committee on the omnibus bill, which he said had run roughshod over bipartisan agreements on overtime protections for workers and the number of television stations that can be owned by media conglomerates. He said the omnibus bill "arbitrarily . . . rips out" overtime protections for eight million workers from legislation that both houses passed earlier. Defending the package, DeLay said the bill held the growth of discretionary spending to 3 percent over last year, which he called "a titanic achievement in fiscal restraint." If the Democrats were in charge on Capitol Hill, "they would be spending much more than what we're spending in this omnibus bill," he said. DeLay also rejected the criticism that the bill contains too much pork, insisting that many House members stood up for "good spending" in their districts on needed projects. In addition to $328.1 billion in discretionary spending, the bill provides for $492 billion in spending required by law for benefits such as Medicare and Medicaid. 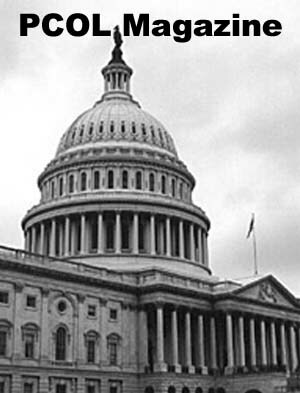 It not only funds 11 government departments, but provides funding for the District of Columbia and foreign aid. Six other spending bills have already been passed for the current fiscal year, which began Oct. 1. Protracted wrangling over such issues as funding for education and health care and outsourcing of federal work, along with the debates over overtime pay and TV station ownership, delayed the final vote in the House. In the absence of new spending legislation governing fiscal 2004, federal agencies and the District have been operating at last year's spending levels under temporary measures. But their authority to continue doing so expires at the end of January. The package contains major spending increases in such areas as highway construction, health care for veterans and international AIDS programs, as well as billions of dollars for legislators' pet projects aimed at benefiting their home districts. - Total spending on highways amounts to $33.8 billion, an increase of $6.1 billion over last year's guaranteed amount and $4.5 billion more than President Bush requested. - The Veterans Health Administration receives $28.6 billion, up $2.9 billion from last year. - The Justice Department receives $19.7 billion, an increase of $316 million over fiscal 2003 and $937 million more than Bush had sought. - The FBI gets $4.64 billion, up $423 million from fiscal 2003, excluding supplemental amounts. - The State Department receives $4.1 billion for diplomatic and consular programs, a rise of $309 million from last year. The additional money supports more than 400 new positions to improve diplomatic and border security and diplomatic readiness. - A global effort to combat HIV/AIDS, tuberculosis and malaria receives $2.4 billion. - The National Institutes of Health is due nearly $28 billion, about $1 billion more than last year.